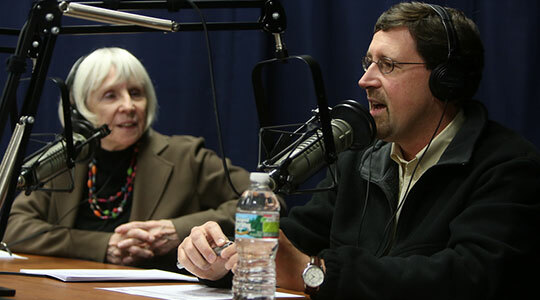 Summary of today’s show: Our panel of Scot Landry, Susan Abbott, and Gregory Tracy consider the news headlines of the week, including Cardinal Seán’s well-received homily at the Vigil Mass before the March for Life; Cardinal Timothy Dolan’s message to the “ultrasound generation”; the appointment of a new director of pastoral outreach and support for the Archdiocese; and Pope Benedict’s assurance that a biblical view of God will help a crisis of fatherhood. 1st segment: Scot Landry welcomed everyone to the show. He said he’s coming to us from sunny Florida today. He and Susan discussed the windstorm last night and then Susan’s catechist convocation in Tewksbury yesterday, one of a series of regional meetings. Susan said she met Scot’s mother there and got lots of stories about Scot from her. Scot said he’s in Florida for the funeral of Cardinal Seán’s stepmother, Claire, who was 90 years old. She died a few weeks ago, but because of Cardinal Seán’s commitments to the March for Life, they had to postpone the funeral. In addition to Scot, there was a good turnout from Boston, including three of our auxiliary bishops and a number of pastors. Scot welcomed Gregory Tracy to the show and asked him about his experience traveling with Cardinal Seán to the March for Life. This year Cardinal Seán was the principal celebrant of the Vigil for Life Mass and his homily won rave reviews from far and wide. The Cardinal also celebrated Mass for a gathering of pro-life leaders earlier in the day. Greg was also on the main stage at the Rally before the March for Life and Scot asked him what his sense was of the numbers. Greg said he’s heard this was the biggest March ever. He said the crowd went back further along the Mall than he’s ever seen before. Scot noted that Cardinal Seán read from the main stage a tweet from the Holy Father that had just come out a few minutes before in which the Pope said he was in unity with those who were marching for life that day. Greg said there was a great response from the crowd. 2nd segment: Scot said the kickoff of the March for Life is at the vigil Mass at the basilica is considered the state of the pro-life movement each year. Forty years ago when the Supreme Court handed down a second Dred Scott decision that renders unborn children, like people of African-American descent in the days of slavery, unprotected by the Constitution of the United States. Since 1973 there have been 55 million abortions – that is how many people there are in Italy, the United Kingdom or France. Scot said that number was a stark reminder and shocking. Greg said that’s what’s insidious about abortion. It starts as individual decisions, but it adds up over the years to this astonishing number. It’s hard to think of it as just as a personal choice when you consider a population the size of a nation has been put to death. We have been wandering in the desert for 40 years but we are getting closer to the Promised Land. Austen Ivereigh has put it very well: “The direction of Western cultural history indelibly marked by Christianity is toward the eventual revelation of the humanity of the victim. Just as the voices of the slave, the ostracized foreigner, the battered housewife, the disabled, and the child abuse victim, have all eventually been heard, so will eventually the voice of the literally voiceless – the unborn child.” … Too many Americans see abortion as a necessary evil. We need to educate the public on the damage done to women by abortion and show that abortion is not a necessary evil, but is simply evil. Susan said she loved that quote from Austen Ivereigh. She one hopes and prays for the moment when the voice of the voiceless is heard. The cardinal in his homily gave some frightening statistics about the choices a woman has before her and that abortion is presented as the most humane of the three choices before her: abortion, birth, and adoption. Scot said the cardinal said that there are 86 abortions for each adoption in this country and there are so many families looking for a child to adopt. Tragically, adoption is seen as the most evil of the three options, as it is perceived as a kind of double death. First, the death of self by carrying the baby to term. The second death perceived by the woman is the death of the child thru “abandonment.” A woman worries about her child being mistreated, abused, and neglected. She would perceive herself as a bad mother, one who gave her own child away to strangers. Basically the woman desperately wants a sense of resolution to her crisis, and in her mind adoption leaves the situation the most unresolved, with uncertainty and guilt for as far as she can see. As much as we might like to see the slogan “Adoption, not Abortion” embraced by woman facing an unwanted pregnancy, studies suggest that in pitting adoption against abortion, adoption will be the hands-down loser. In fact while abortion itself is seen as something evil, the woman who is making that choice is seen as courageous, making a difficult but necessary decision. The study goes on to show that abortion is considered the least of the three evils because it is perceived as offering the greatest hope to a woman to preserve her sense of self. This is why so many women deeply resent our pro-life movement which they perceive as uncaring and judgmental. We have consistently focused on the safety of the unborn child while the pro choice, pro abortion activists focus on the woman in crisis. With almost 100 abortions for every adoption, we have so much more work to do. The cardinal goes on to say how we have to change hearts and show that abortion is the greatest of three evils. Susan said she always thought that we were concerned with the woman and caring for her, that it wasn’t one or the other. It’s both-and. So this startled her. The Vitae Foundation has had amazing results with their television advertising that has increased pro-life sentiments among the general population in the areas where they appeared. We must never lose sight of the fact that we must work to change the laws, to overturn the Roe vs. Wade decision, but we must work even harder to change people’s hearts, to help Americans understand that abortion is evil and unnecessary. Spielberg’s film, Lincoln, shows the monumental struggle against slavery and Lincoln’s resolve to pass the Thirteenth Amendment, but the law was only part of the struggle. The evil of racism perdured for over a century and the civil rights legislation and sacrifices of so many are contemporary realities in an ongoing struggle to live the ideals of our country. Changing hearts is always the hardest part. The laws will change. Hearts are harder to change. We must never tire of clarifying misunderstanding and shedding light where there is myth and confusion, demonstrating empathy and compassion and a deeper vision. That is the method being presented by Catholic Voices. It is not just about the lucidity of our arguments; it is about the effect that our words have on others. Our task is to present the truth with civility, empathy and clarity. Being champions of the Gospel of Life is about building a civilization of love. Scot said the cardinal is motivating everyone, informing about the results of the study, and then challenging us as we carry out the work of the pro-life movement. Scot said too often the pro-life message is presented with the least charitable, least empathetic arguments. Greg said he does see that there is a huge spectrum of pro-lifers who run the gamut. In any kind of dialogue, those kind of extremes stick and that’s what people notice. There are obviously people on both sides who are very committed. But there are a lot of people in the middle who don’t think about it every day and in those circumstances what cuts through the background noise of life are the extremes. Cardinal Seán’s point is true: pro-abortion groups come across as pro-woman. Susan said the cardinal made it clear that the majority of people, when presented with rational facts and statistics, people respond in a pro-life way. Not when confronted with extreme language and graphic images. She wins an Audio Book CD “St. Bernadette of Lourdes”. Scot said he hasn’t seen it written like this before, but he does know that the Knights of Columbus underwrite ultrasounds for crisis pregnancy centers to show mothers in crisis that their baby is a baby in their womb and to activate that maternal instinct to protect the children. Susan said the cardinal ended the column: “My faith in you is high. For I have seen, and I believe – in you.” She said she has been in so many homes where the ultrasound picture is on the refrigerator door, proclaiming the new member of the family. She said in decades past the science textbooks had beautiful imagery of unborn children in the womb and those images have disappeared. Cardinal Dolan said this generation doesn’t have enough to just see and believe, but to go out and do something. Scot asked Greg about his own teens hearing this and whether they are moved to take action. Greg said the cardinal made a clarion call to a new generation. An old way is passing and you, the next generation, are the new way. He said his kids have always been introduced to their new sibling through ultrasound. Greg said he became pro-life after seeing the ultrasound of his first child. He’d converted to Catholicism shortly before marriage and he’d been a secular person who didn’t give much thought to these matters. But at the moment he saw the first ultrasound, it clicked with him that this is a baby. Also in the Pilot this week is the appointment of Vivian Soper of the director of the Office of Pastoral Support and Outreach for the Archdiocese of Boston, who is succeeding Barbara Thorp. She is a resident of Weymouth and sister of Fr. Paul Soper, director of Pastoral Planning for the Archdiocese. Vivian formerly worked for Catholic Charities of Greater Boston. Scot said in Vatican news, the Holy Father is explaining different parts of the Nicene Creed throughout the Year of Faith. He recently addressed the term “Almighty Father”. “For those who have had the experience of an overly authoritarian and inflexible father, or an indifferent, uncaring, or even absent one, it is not easy to calmly think of God as a father or to confidently surrender themselves to him,” he told the crowd. “But a Biblical revelation helps us to overcome these difficulties by telling us about a God who shows us what it truly means to be a father,” the pontiff said. “Jesus reveals God as a merciful father who never abandons his children and whose loving concern for us embraces even the cross,” he said. Scot said we talk about the words of the Holy Father because people may not hear them elsewhere and it’s his hope that someone listening can hear these words and find hope and healing. Susan recounted a story of a first grade religious education class in which a boy who heard the God is Father said that his father hits him and this puts the Pope’s words in perspective. Greg said he too knows people who have trouble embracing the Fatherhood of God because of their experience of their own fathers. He said in marriage preparation classes, he often talks to men about how they treat their future children will affect how they relate to God the Father.